Granville is a suburb in western Sydney, in the state of New South Wales, Australia. Granville is located 22 kilometres (14 mi) west of the Sydney central business district, split between the local government areas of Cumberland Council and the City of Parramatta. South Granville is a separate suburb with the distinguishing feature of a light industrial area. Lisgar, Redfern, Heath and Mona Streets form the approximate border between Granville and South Granville. The Duck River provides a boundary with Auburn, to the east. Granville was named in 1880, after the British Foreign Secretary, the Granville Leveson-Gower, 2nd Earl Granville. The area evolved primarily after 1855, when it became the final stop of the first railway line of New South Wales. The Sydney-Parramatta Line ran from Sydney terminus, just south from today's Central railway station to the Granville area which was originally known as 'Parramatta Junction'. This led to the development of this area, which attracted speculators and some local industries. In the early days of European settlement, timber was harvested to fuel the steam engines in Sydney and Parramatta. By the 1860s, the supply of timber was exhausted. The remainder was used by scavengers who made a living by collecting firewood. Wattle bark found use with tanners and the bark from stringybark trees was used for roofing of huts. In 1862, a major estate, Drainville, became subject to a mortgagee sale and subdivided for villa homes, and small agricultures. At the end of the decade a Tweed Mill was established, which was steam powered using water from the Duck River. In 1878, the locality received its own post office, which was then part of the stationmasters house. In 1880 Parramatta Junction was renamed to Granville, after the British Colonial Secretary, Granville Leveson-Gower, 2nd Earl Granville. The place then had a population of 372, of which 176 were male and 196 female. In this era some German settlers, Joseph Klein and P W Merkell, tried to establish vineyards in the area, but eventually found the land was not suited for this type of agriculture. More farmers discovered the limitations of the local soils and fruit growers complained about the damage from flying foxes. Thus, the only practical use for the grasslands, which replaced the original bushland, was for dairy cattle. The Granville Municipality was formed in 1885 and the council carried on the local government of the area until 1948, when it became part of an enlarged City of Parramatta. On Anzac Day of 1974, Granville was partially severed by flooding of the Duck Creek stormwater channel due to torrential rain that fell over the area. 135 millimetres of rain fell between 11.30 pm and 12.30 pm at Guildford, with the ensuing flood doing major damage through Granville. The nearby RSL underwent damage and many of the club's old photographs and honour boards were destroyed. Granville is also the location of the Granville railway disaster, which occurred on 18 January 1977 when a commuter train derailed just before the Bold Street overpass and hit the staunchion, causing the bridge to collapse. 83 people perished, making it the worst rail disaster in Australian history. Granville has a mixture of residential, commercial and industrial developments. The commercial and residential developments are mostly around Granville railway station and Parramatta Road. Granville is primarily dominated by freestanding weatherboard, fibro and unrendered brick buildings. The area is no longer exactly "typical" quarter acre block territory, but 500 to 600 m2 (0.12 to 0.15 acres) blocks are reasonably common. Terraced houses are rare, but increasing in number. Apartment blocks, generally three to four storeys in height, are also becoming more common in the vicinity of the railway station. St. Aphanasius Church, a Ukrainian Autocephalic Orthodox with onion domes, adds some interest to William Street. It dates back to 1956. The White Palace in South Street has an exterior with Art Deco features. The building was gutted and redeveloped in 2007. The intersecting circles of Granville RSL Sub-Branch Building serves as an interesting example of modern architecture. It was designed by Frank Fox & Associates. The "Crest" Theatre, originally a movie theatre. The Crest building on the corner of Blaxcell and Redfern Streets, was built by Hoyts in 1948 as a movie theatre and was used for screening films up until 1963. The structure of the building is of a Quonset hut design, while the facade and interior is of a post-Art Deco and post-Moderne eclectic style, influenced by the "Picture Palace" architecture popularly used for movie theatres. It is now used as a function hall. The Crest Theatre is now listed in the NSW State Heritage Register as being of "State significance", being one of the few cinemas built in Australia in the 1940s. Externally and internally the building remains largely intact, though the signage on the external decorative pier now reads "B-L-O-U-Z-A", rather than the original "H-O-Y-T-S" (later it was "B-I-N-G-O"). Granville railway station is a major station on the Inner West & Leppington Line and Western Line of the Sydney Trains network. The station is wheelchair accessible. Granville railway station is located on the Main Suburban line. It is served by Sydney Trains T1 Northern and Western Lines and T2 Inner West & Leppington Line services. Granville's newly built bus interchange, as well as a car park, are located adjacent to its train station. Bike racks and lockers are located nearby. Taxi ranks can be found just south of the train station. Parramatta Road has always been an important thoroughfare for Sydney from its earliest days. From Parramatta the major western road for the state is the Great Western Highway. The M4 Western Motorway, running parallel to the Great Western Highway has taken much of the traffic away from these roads, with entrance and exit ramps close to Parramatta. Granville has a major college of Technical and Further Education, which is part of the South Western Sydney Institute of TAFE. Schools include Granville Boys High School which was founded in 1926, Delany College, Granville Public School, Granville East Public School, Blaxcell Street Public School and Holy Family Catholic School. The suburb is also home to a Cumberland Council branch library. The suburb boasts four pubs. The Royal Hotel and the Granville Hotel are located south and north of the railway line respectively. The Rosehill Hotel is located on the northern side of Parramatta Road and the Vauxhall Inn is on the same street on the western edge of Granville on the corner of Woodville Road. Granville is also home to a sub-branch club of the RSL, known as Granville Diggers. Attractions include live music, bingo, karaoke etc. Granville has an Olympic size pool and a football facility. Historic Garside Park is home to State Super League and Super Youth League club, Granville Rage. Sydney Speedway is a 460 metres (500 yards) dirt track speedway which opened in 1977 at the old Granville Showground as the Parramatta Speedway. The clay surface caters mainly to Sprintcars and has been home to some of Australia's greatest drivers including ten times Australian Sprintcar Champion Garry Rush, and multiple title holders George Tatnell, his son Brooke Tatnell, and Max Dumesny. The speedway is also the only venue not in North or Central America to host a round of the famous World of Outlaws sprintcar series. Granville Magpies Soccer Club entered the Sydney competition in the early 1880s and has continued to compete with distinction until the early 2000s. The club originally played matches at a paddock behind Hudson Brothers' Works in Clyde before relocating to Macarthur Park, known nowadays as F.S. Garside Park. At the 2011 census, there were 13,989 residents in Granville. More than half of people were born outside of Australia, with the top countries of birth being India, China and Lebanon. Three-quarters of people spoke a language other than English at home. The most common other languages spoken at home were Arabic 18.1%, Cantonese 5.5%, Mandarin 4.8%, Turkish 2.3% and Tongan 2.0%. The housing in Granville was evenly spread between detached houses and higher density units or apartments. 46.3% of residents were renting their home and this was higher than the national average of 29.6%. 52.6% are male, with 47.4% being female. 66.3% of people were born outside of Australia, with the top countries of birth being India (10.4%), China (7.6%), Nepal (5.9%), Lebanon (5.1%) and the Philippines (3.4%). 21.9% of people only spoke English at home. Other languages spoken at home included Arabic 14.9%, Nepali 6.6%, Mandarin 6.1%, Cantonese 5.1% and Hindi 3.9%. For religious affiliation, the top responses were Catholic (21.1%), Islam (19.7%), Hinduism (15.6) and No Religion (14.1%). ^ a b c Australian Bureau of Statistics (27 June 2017). "Granville (State Suburb)". 2016 Census QuickStats. Retrieved 21 December 2017. ^ Granville: From Forest to Factory, John Watson (ed. ), 1992, Granville Historical Society. ^ Duck Creek – Flooding File, Sydney Water. ^ Parramatta – a Past Revealed, Terry Kass, Carol Liston, John McClymot, 1996, Parramatta City Council. 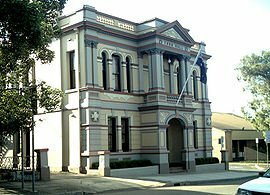 ^ "Granville Town Hall". New South Wales State Heritage Register. Office of Environment and Heritage. H01679. Retrieved 18 May 2018. ^ "Crest Theatre". New South Wales State Heritage Register. Office of Environment and Heritage. H01664. Retrieved 18 May 2018. ^ a b "Crest Theatre" listing on the NSW State Heritage Register. ^ "Transdev NSW route 906". Transport for NSW. ^ "Transdev NSW route M91". Transport for NSW. ^ "Transdev NSW route 908". Transport for NSW. ^ "N60 Nightride". Transport for NSW. ^ "Australian Dictionary of Biography". adb.anu.edu.au. Retrieved 2015-08-03.